"Do nothing unless you're supposed to." Atomic Robo has a propensity for doing good things, regardless of where he finds himself. And he's found himself in quite a few varied situations across time and space, all of which require a different reaction. 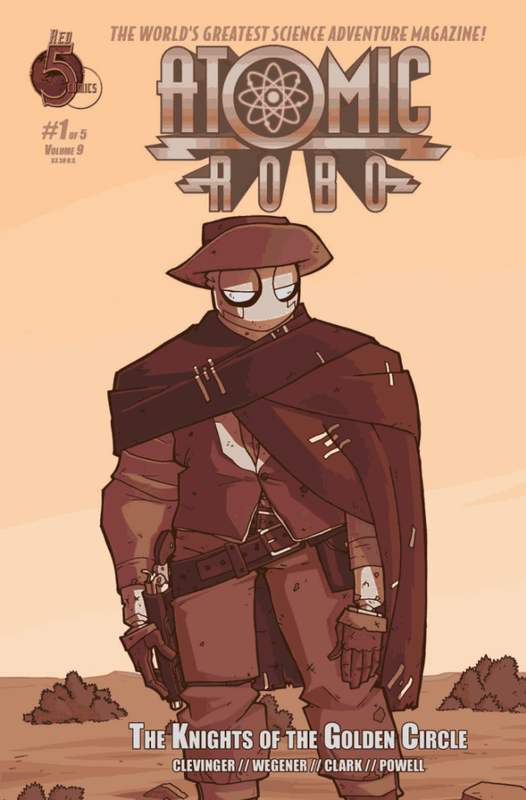 His latest adventures send him to the wild west in Atomic Robo Vol. 9 #1: Knights of the Golden Circle from Red 5 Comics. The issue is written by Brian Clevinger, illustrated by Scott Wegener, colored by Anthony Clark and lettered by Jeff Powell. Atomic Robo finds himself in 1884 in the wild west with explicit instructions to stay out of trouble. That goes pretty well for him until he stumbles on the Butcher Boys, a group of outlaws accosting a seemingly helpless old man. And by accosting, they've shot him and Robo needs to rush him to safety. As outlaws are wont to do, the boys trail Robo to a bar where he seeks help for the old man, threatening the life of everyone in their if he doesn't come out. Fortunately for him, he's got the law on his side in Deputy US Marshal Reeves, who recognizes a potential hero when he sees one. Reading through Atomic Robo Vol. 9 #1: Knights of the Golden Circle feels pretty good and the script offers quite a breezy tale. Robo is really just in the wrong place at the wrong time, but that won't stop him from doing what he knows is the right thing. Clevinger taps into the dialect fairly well and keeps the reader engaged in both the action and the setting. Putting Atomic Robo in the wild west is also pretty interesting because it serves as a juxtaposition of time; the thing is, apparently he's known around there as a legendary hero named Ironhide. How he reconciles his current position with the legend remains to be seen and should be fun reading. For a book about a robot in the wild west, you need art that's almost equally as ludicrous. Wegener is clearly having a blast with the art, as the cleanly defined characters still manage to look a little cartoony. Robo maintains all of his recognizable features, which admittedly aren't much, but it's humorous to see him dressed in western garb. Other characters carry varying degrees of heft to them and contrast with one another in a way that makes the world feel sufficiently populated. There's solid coloring as well by Clark that keeps things moving along and further immerses the reader in the tale. Atomic Robo Vol. 9 #1: Knights of the Golden Circle is another entry in the Atomic Robo series that places him in another pretty crazy scenario. Newcomers to the property might be a little put off by the work as it's somewhat steeped in Atomic Robo lore (it's not that you'll have no idea what's going on though if you don't know the character). Clevinger writes with a relatively light style that emphasizes the feel of the time and place through the character dialogue. Wegener's illustrations are equally as bright, as he manages to make a book about outlaws trying to finish off a target relatively light. Atomic Robo Vol. 9 #1: Knights of the Golden Circle is a book that's a lot of fun to read and really doesn't expect to be taken too seriously. Atomic Robo Vol. 9 #1: Knights of the Golden Circle is in stores now.